This package is a great option for a small party. If you are only expecting 1-10 children to attend a your party, this is the perfect package for you! 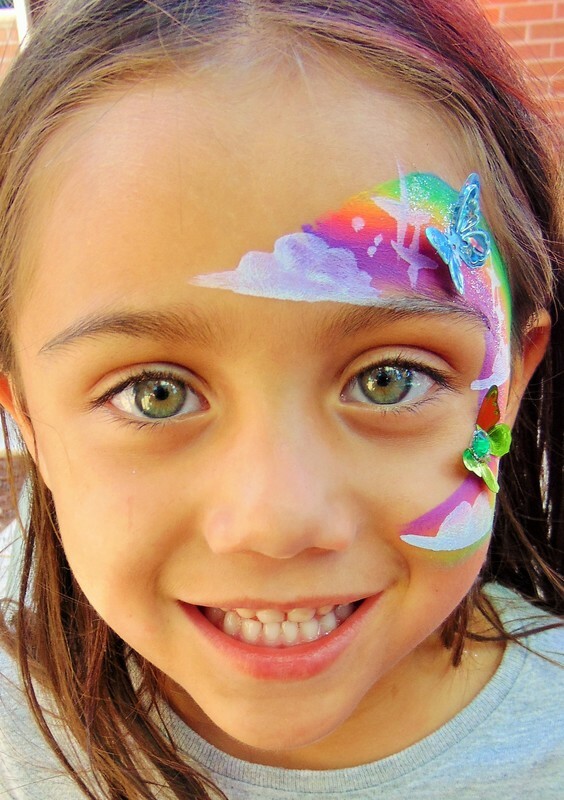 A skilled face paint artist will come to your small party and paint up to 10 children. Your artist will bring his/her own equipment, this includes but is not limited to, table, chairs, mirrors, and paints. Your artist will paint any sized design from cheek art to full face. Our most popular party package and there is a good reason why! During the 2 hours your artist is there he/she will able to paint the children of the event with what ever their heart desires, from small cheek art or a full face animal of their choosing. This package is great for the larger party, even the adults are invited to join in the fun, if there is time after the children all get gussied up. A skilled face paint artist comes out to your event or party prepared with his/her equipment. This includes but is not limited to, table, chairs, mirrors, and paints. Your artist will paint any sized design from cheek art to full face. This is a great package for a corporate event where there will be a large number of children. A skilled face paint artist comes out to your event or party prepared with his/her equipment. This includes but is not limited to, table, chairs, mirrors, and paints. Your artist will have a handful of simple designs for your guests to choose from. This party package is a great option if you like to see your child's classmates thrilled! You can have an artist come out for your child's birthday or class room holiday party or field day. A skilled face paint artist comes out to your child's school or party during the week for a single hour. During the hour your artist will have 6 simple designs for children to choose from, 3 boy designs and 3 girl designs. No special requests can be made because of time restraints. A promised 20 children can be painted in an hour. This party can only be booked Monday Through Friday and can not get the 10% weekday discount. Your party must be booked inside Santa Rosa city limits, if outside of Santa Rosa $1.00 will be charged per mile. *This package can not receive any discounts including off season or week day 10% discounts. This package is ineligible on a holiday. Please scroll to the end of the page for list of holidays. Planning a night out at the club? Want to go to play lazer tag and play the part? Well Clementine The Amazing has just the thing for you. Blacklight reactive face paints that glow wonderfully under the black light. This package is great for grad night, black light bowling, laser tag gaming, club going or a fun photo shoot. Your artist will come prepared with a full range of black light paint and paint you and you guests with designs of your choosing. If you choose to add on the glitter tattoos we also have a wide range of black light reactive glitters to choose from. Glitter tattoos are water and sweat proof! We service surrounding areas of Santa Rosa, any location out of our 30 mile service area will be subjected to a $25 service fee for each additional 15 miles, up to 45 additional miles for $75. If you are trying to book last minute, within 1 week of date your desire, we have to work extra hard to make this happen, and thus we charge an additional $25 per booking.